Termites, carpenter ants, carpenter bees and powderpost beetles can eat the wooden, structural beams in your home and you probably won’t know it until visible damage is done. Even if you know how to spot early evidence of these pests in your home, you still won’t have the tools to treat them effectively and that’s because there can be hundreds of thousands of them in one colony. 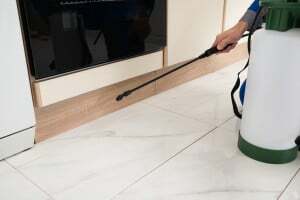 There really is no pest infestation that cries out more for professional extermination than these house-eating invaders – especially termites – because there are no good DIY treatments for them on the store shelves. It’s possible to eliminate a single fire ant mound with commercial fire ant baits and old-fashioned (but usually dangerous) treatments like gasoline; but fire ants are wise to what you’re doing. They simply relocate by digging another subterranean tunnel in a different direction. Getting professional help with fire ants is important because their venom can cause sometimes deadly allergic reactions in people who are sensitive to it, especially small children and pets. Bed bugs are notoriously hard to get rid of. They’re tiny; they come out in the wee hours of the morning – between 3am and 5am – to feed on your blood (or your pet’s blood); and they hide easily during the day. There are some firstline, offensive things you can do when you suspect you have bed bugs but in general, you will not be able to stem the bed bug tide. Swarming insects will attack en masse if their nests or hives are threatened. They pose a danger not only to people who are allergic to their venom but to anyone who might be stung multiple times. Only professionally-trained bee and wasp-removal experts who have the proper equipment should remove nests and hives that are heavily-populated. While there are hundreds of insects and spiders you can encounter in your yard and home, there are some that are simply too hard for the average homeowner to eliminate completely. Only trained technicians with the right equipment and chemicals can stop them. Call Safe Pro Pest Control Frisco TX today at (972) 435-0700 for an inspection of your home and yard.